The Braven 650 portable speaker is more than just that -- it’s also a portable phone battery, charging your mobile if you’re not near a power point. It’s as easy to use as any Bluetooth speaker could be, and it sounds pretty good too. 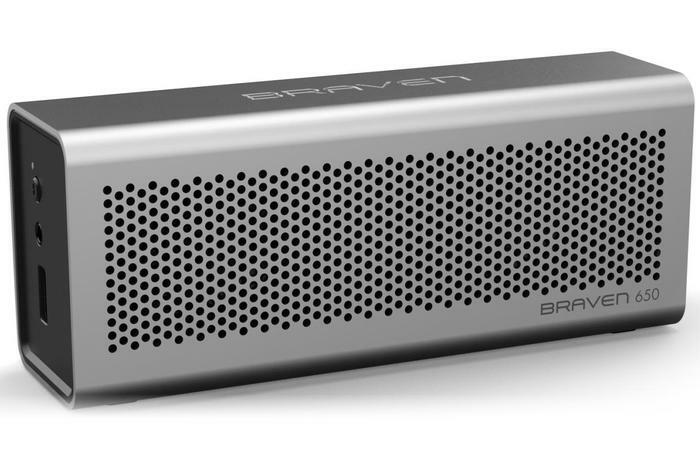 The Braven 650 is a premium portable Bluetooth speaker, joining a category kick-started by the Jawbone JAMBOX. It’s a versatile little device, although you pay for its convenience. As small speakers go, it sounds good. The Braven 650 speaker, measuring 158 x 69 x 45mm, is not a tiny device by any standards, but it’s small enough to slip unobtrusively into a backpack or travel bag. It weighs just under 400 grams — not too light, but definitely not heavy. It looks surprisingly similar to the now-aged Mac Pro, with an anodised, silver aluminium shell cut with a pattern of small holes on the front and back. 688 holes, in fact. We counted. There’s a BRAVEN logo up top, and two small rubber feet on the bottom, but it’s the left and right sides of the 650 that are the most important. On the left side, you’ve got two ports, one switch, and three buttons — microUSB charging, 3.5mm stereo audio input, power on/off, volume up and down, and a multifunction Bluetooth/phone call toggle. On the right, it’s all about outputs — there’s a check battery button with a light (white for more than half full, blue for less than half, and red for critically low), a 3.5m stereo audio output, and a USB port. The USB port is probably the most useful (and innovative feature) of the Braven 650 apart from the speakers themseves — as long as you’ve got the USB charging cable for your phone, you can hook it up to the 650 and charge it at least partially. It’ll also drain the speaker’s battery completely, giving you as much juice as it possibly can. With the 2000mAh battery pack inside the Braven 650, you’ll get around 60 per cent charge on a modern big-screen Android smartphone like the Samsung Galaxy S4, and a full charge on an iPhone 5 with enough power left over to play a couple of hours of music as well. The Bluetooth connection of the Braven 650 is simple enough to set up — as long as the speaker’s switched on, it’ll be constantly visible and can remember the pairing of up to 8 devices at once (add more and the first-added will be dropped off). No passcode is needed on most modern smartphones and tablets — click the Connect button in your device’s Bluetooth menu and the rest happens automatically. You can even connect two devices to the 650 at the same time, although if you play music from one while using another, the speaker will switch to the newest audio source. Braven’s 650 has a stereo speaker setup, distinguishing it from the JAMBOX and the plethora of other portable speakers that only have a single-speaker array. There are two tweeters on the 650’s ‘front’, measuring around 2/3-inch, and two slightly larger mid-range drivers on the ‘back’ at around 1-inch. The rationale behind this is the directional nature of high-frequency sound — if you’ve got tweeters, they ought to be pointed right at you. Mid-range and bass sound waves, with their lower frequencies, are less directional and can conceivably bounce around a little before they reach your ears. The speaker doesn’t sound all that good at low volumes, since there’s a slight background hiss that can drown out other audio at minimum and nearly-minimum levels. Turn it up even slightly, though, and the hiss disappears to be replaced by reasonably clear treble, with a moderate amount of mid-range from the rear speakers. It’s clear and even surprisingly punchy at volumes all the way up to its maximum, which isn’t exactly ear-bleedingly loud but would fill a small room with no problems. For a portable speaker, the 650 actually sounds pretty good — it would make a good accompaniment to a tablet as a portable hotel-room entertainment system, we think. We recharged the Braven 650 from empty to full battery in 4 hours and 11 minutes from its included 5 Watt charger. If you use the 10 Watt USB charger included with most tablets and high-end smartphones, this charging time should drop considerably. We played the Braven 650 at a moderate-to-high volume from a full charge, with about 16 hours of music playback time — at a slightly lower volume we could easily see this rise to Braven’s 20 hour claim. This portable Bluetooth speaker is a great little device; if you just want to listen to music in your hotel room, it’ll handle that just fine. You can even play music off two devices, although not simultaneously. Its phone-charging ability comes as a useful added extra.